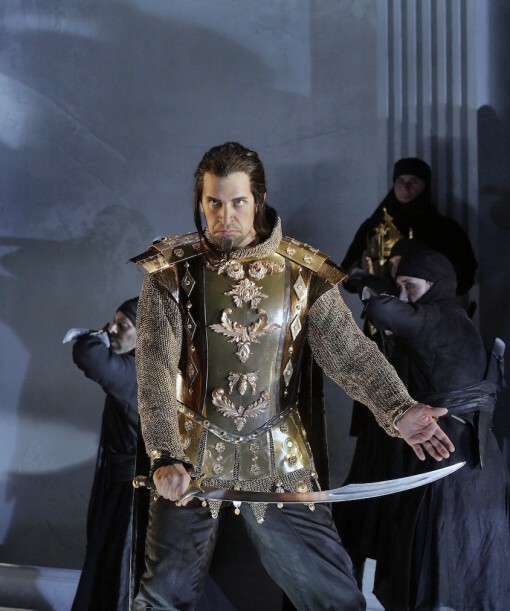 If Maometto is facing stage left then his sword in his right hand is downstage -- thus in view of the audience. I should know as I directed the production and am always very careful about these things. Perhaps there was a problem in the performance you attended -- with the violent storms which sweep through the Santa Fe auditorium sometimes the performers must make adjustments. Not that you mentioned me or the directors of the other productions. Hi. I'm not a professional reviewer, nor am I trying to become one. My educational and professional background is in singing, so that's what I focus on. I find the music to be the least well covered in the press of all the parts of an opera. Lots of bloggers write only about the production, so I tend to think it isn't being slighted. I was more concerned that I didn't write about the conductors. Five operas in 5 days is a lot for me. Luca is right handed, and the sword he wore was about half the length of the one shown in the picture and was on his left side. We were warned by Oliver that this would not play. I had my binoculars and watched very carefully. You are making it sound like he was supposed to have drawn the sword and then she stabbed herself with it, but we didn't see it until their bodies separated and the stabbing had already occurred. This is probably not what you intended. I don't know what else to say. You don't need to say anything else (this being your blog)! I carefully rehearsed this scene and when I regretfully left beautiful Santa Fe (after the 2nd performance) it had always been clear that Anna took hold of Maometto's sword (in his right hand) and stabbed herself with it. Anyway, now the show is history (although several opera companies are discussing presenting it along with the brilliant cast in the future). I too grew up when Rossini's serious works were virtually unknown and am very proud to be playing a part in bringing these great pieces back to the stage (in the future I am staging La gazza ladra, actually a semi-seria piece, hopefully Semiramide, and I very much want to do Zelmira!). I have an idea about this. 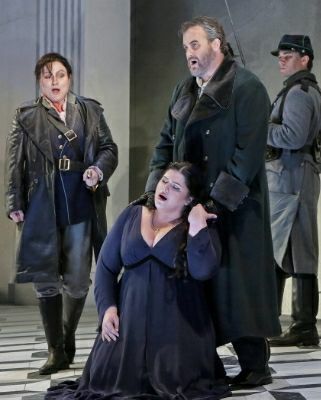 It was obvious that Leah, while she may not have had a problem singing the entire opera, was having trouble standing the entire time. Changes? What a wonderful opera, esp. the version that Santa Ferguson had, with the original ending and the terzettone (big fat trio). The only commercial DVD is of the happy ending.